The first discovery of coal in North America was by Joliet and Marquette near Ottawa, Illinois, on the banks of the Illinois River in 1673. Another report tells of Father Louis Hennepin traveling the Illinois River in 1668 when he noted in his journal a "cole mine" near the present site of Ottawa. The first significant mining of coal occurred between 1810 and 1840 mainly along waterways where the coal seam had been exposed. 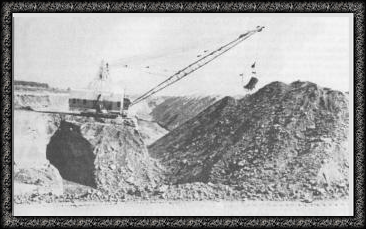 Starting in the 1860's, the northern Illinois coal boom began, and Illinois figured prominently in coal production. 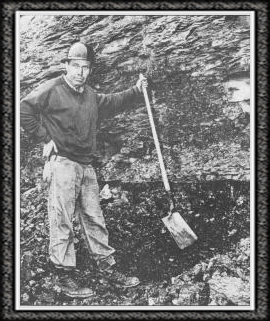 In the 1820's Peter Lamsett first discovered coal in Grundy County along the Mazon River in Goose Lake Township when outcrops occurred in several locations. Lamsett sold and traded it to blacksmiths and farmers, who found it better and cheaper than ear corn or wood. He never profited from his experiences to any extent, for he was a nomad. 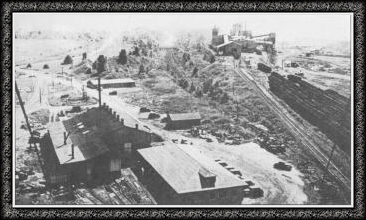 A strong factor in the development of Grundy County was the discovery of the coal beds, the mining of which has given employment to thousands. Transportation and the economies of the time made it more practical for the miners to live within walking distance of their work. Towns sprung up in Felix and the southern townships, as well as adjoining Will County. Populations would rise and fall as the mines opened and then became worked out. Miners moving from one mine to another, as well as one town to another, often moved house and all. Other homes mysteriously burned, and insurance was collected. The coal measures in Goose Lake Township roughly follow a line from the mouth of the Kankakee River to Goose Lake Slough, then west to the west end of the slough, and then in a northwesterly direction to the Illinois River in section 32. To the north of this line, shale and shaly limestone will be found, and to the south the coal measures. The coal cropped up to very near the surface on many points of this line and was worked extensively in the mid-late 1800's by local farmers and entrepreneurs. As many as 15 shafts and strippings were found south and west of Goose Lake Slough in the 1870's, and the coal vein was a full 30 inches thick. These were in sections 15 and 16. The coal deposits in some parts of the township presented some freaks of nature. In small areas veins of coal have been found which are from eight to eleven feet thick, but they seem to be merely pocket deposits or rolls and would dwindle to a mere shell within a few feet. The coal seam east of the Jugtown Pottery was generally about 20 feet below the surface; however, one shaft found it to be 40 feet down, and after yielding about 300 bushels, the coal ceased abruptly, on all sides. The Peart family, listed as coal miners at Jugtown in the 1860 census, had nine shafts on their farms east and south of the pottery works. 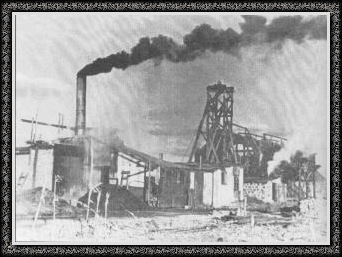 It is believed they were the first landowners to mine coal to any extent in Goose Lake Township. Hager Brick and Tile Co. stripped the vein in section 10 in their quest for the fire clay that underlays the coal seam. Nicholson and Peart had a shaft mine in the southeast corner of section 9 from 1932-35. It is believed the Benson family operated a mine in the southeast corner of section 19 in the banks and bed of the Mazon River. The coal at their mine was about 8 feet below the bed of the creek, and an offshoot of the main seam about seven inches thick was exposed in the bank. In the 1900 to 1920 era coal mining declined in Grundy County due to labor problems and competition from the southern Illinois fields, where the coal veins were much thicker, and the development of the railroads caused the southern Illinois coal to become more profitable. The coal companies could not justify installation of mining machinery in a seam of only two or three feet thicknesses, and production by hand was too expensive. Only a few shafts were operating in the late 20's and early 30's. Some stripping was done north of Pine Bluff Road in the 1870's. The coal cropped up near the surface, and plows, scrapers, and horses could be used economically in removing a small amount of overburden. 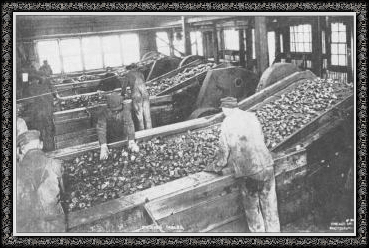 The coal was taken up entirely by hand. In 1924 it was generally thought that it would be unprofitable to strip a vein of less than four feet in thickness; in 1927 this estimate had been reduced to a foot and continued to drop as larger machines were developed. 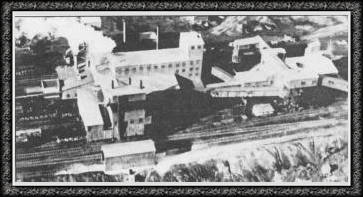 Northern Illinois Coal Company began to erect its first stripping shovel September 28, 1927, and began its first production of coal in March, 1928, from an area west of Wilmington, where the first coal cleaning plant was erected. This plant, called the "tipple," was at the site where the Cinder Ridge Golf Course is now. 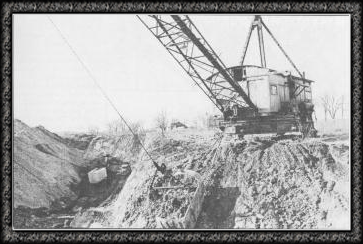 The electric shovel, a Marion 5480, was the largest machine yet constructed for strip mining. It carried a 90-foot boom with a 60-foot dipper and a 12-yard bucket. 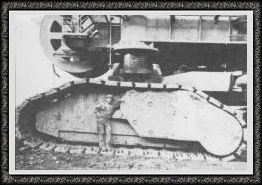 The machine was mounted on crawler tracks, weighed 1,665,000 pounds, and was equipped with hydraulic jacks to keep the turntable completely level. 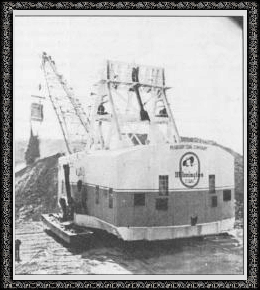 A second machine, a twin to the first, was put into operation in late 1928, and the machines operated 24 hours a day, giving a capacity of 28,000 cubic yards per day. Two draglines, a six-yard and a ten-yard, were also put into operation. These machines differ from shovels as they had longer booms (150 and 170 feet), and the buckets were lifted by steel cables and drug towards the machine by the drag cable to load. They could dig deeper and cast the overburden farther than the shovels. The first cut to reach to coal was called the "box" or "through" cut. After this was made, the machines would drop down on the coal and proceed in tandem, being followed by the coal loading shovel. 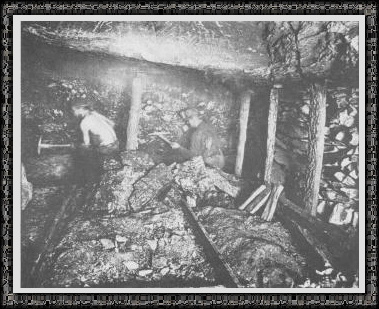 After the coal seam was exposed, it was cleaned of all dirt by men with brooms and shovels. The coal loading shovel had a bucket capacity of one ton. It could load the 40-ton side dump rail cars in eight minutes. The railroads running into the pits were of standard weight and gauge, and a small gasoline-driven locomotive, called the dinky, would shuttle the cars from pit to the tipple and back. The pits were pumped out by electric-driven 6-inch centrifugal pumps to drainage ditches. At the tipple, which could process 400 to 600 tons per hour, the coal was dumped into a concrete and steel hopper of 240 tons capacity. 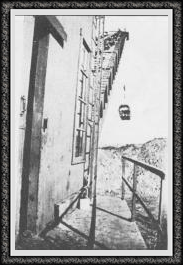 From this hopper the coal was fed to a 48-inch steel-flighted conveyor belt, 550 feet long, which carried the coal to the top of the tipple, about 50 feet above ground level. From this belt the coal was directed to 8-foot wide by 30-foot long steel screens, which shook back and forth, each having a series of graduated holes, with the coal passing and falling into various classes as to size. The screens yielded various sizes of coal, six-inch lump, six-by-three egg, three-by-two nut, two-inch screenings, or other sizes changing the perforated plates. 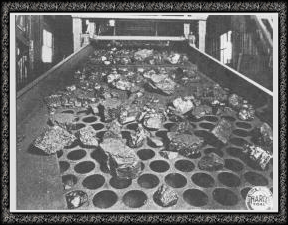 After passing through the screens the coal was discharged onto a flat-top conveyor belt, where any foreign matter was picked up by hand and deposited into refuse chutes, where the material went into a holding bin provided with a gate to load into cars for disposal. From the picking tables, the coal could be loaded directly into railway cars or sent to a mixing conveyor to make any combination of the various sizes desired. The various grades of coal, such as mine run, slack or screenings, nut, egg, and lump, were loaded by counter-weighted booms, which raised and lowered when loading cars. The tracks were inclined, so no mechanical power was required to shunt cars around to be loaded and, subsequently, made up into trains. 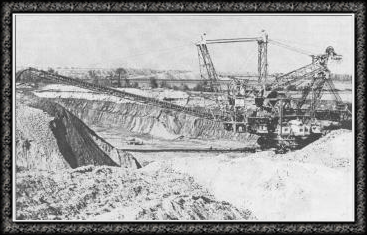 This operation recovered 98% of the coal seam, while the shaft mines would only recover 65% to 75% of a coal seam. Workers were paid $7 for eight hours, when most jobs only paid $2.50 per day. 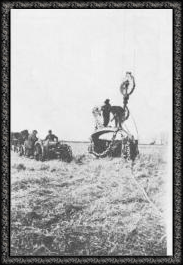 By 1936 the company had five draglines from 1.5 to 14 yards capacity and three shovels from 3 to 33 yards capacity operating in Goose Lake Township. They employed 475 men and had $5 million invested. The company averaged one million tons per year production, with a peak year of 1.5 million tons. The coal Companies called their product "3rd Vein Coal" as it was a superior coal to that of the first and second veins. The coal was hauled from the early mines by wagons. In later years rails were laid to some of the shaft mines and all of the early strip mines. Fifty-ton trucks were used in the later years of stripmining in Goose Lake Township to haul the coal out of the pits to Dell Abby, where it was loaded in gondolas for shipment to the tipple via the Atchison, Topeka, & Santa Fe Railway. It was reported March 13, 1939, that the Northern Illinois Coal Company had stripped 1500 acres in Felix and Goose Lake Townships. The company owned 1833 acres in Goose Lake, 1890 in Felix, 315 in Saratoga, 411 in Morris, and 59 in Braceville Townships and had options on 10,000 additional acres in Grundy County. The coal averaged about 3200 tons per acre, and most was sold for about $3.00 per ton, yielding $10,000 to $11,000 per acre. The coal company paid from $150 to $500 per acre. Payments averaged about $250 and varied with respect to location rather than in proportion to the value of the land for agricultural purposes. Most of the land stripped was worth from $50 to $100 per acre for farming, and some of the finest land in the county had been purchased. Opinions were sharply divided between owners who anticipated an opportunity to sell at a high figure and the majority of farmers who had no opportunity to share the lucrative profits of this enterprise. Many farmers were much concerned about the effect of stripped areas on the value of adjacent properties and in the entire community. This was most effectively shown by the fact that the Federal Land Bank had reduced the land value of farms located within a couple of miles of a strip mine to the extent of about one-third. The Farm Advisor reported that farmers were thinking about the long-time effects on the tax base, particularly in several school districts involved. Obviously, the farmers who had not been afforded an opportunity to sell, but who were located near the stripped areas, were those who felt bitter toward the coal companies. The sale value of their property had meen materally reduced, and they were subject to all of the devastating effects of the worked lands, which not only ruined the landscape, but constituted a haven for predatory animals. With respect to possible regulatory measures, it appeared that many farmers thought that the coal companies should not be permitted to work the most valuable agricultural lands, and that they should be compelled to level off the ridges in the less valuable agricultural areas. The company updated its machines over the years; and, at the close of strip mining in Goose Lake Township, there were six draglines, the largest being Marion 35-yard machines, and one shovel, or "mucker." In 1947 the company started operations and constructed a tipple near Braceville. 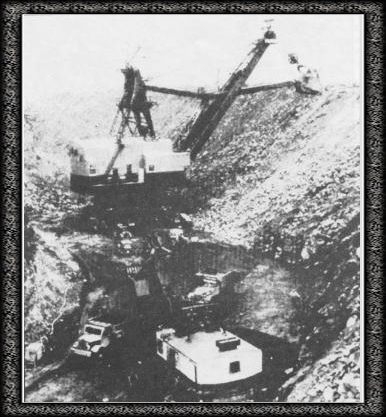 The "Northern" moved its machinery and draglines from Goose Lake Township, southeast of Braceville in 1950-51, and continued operation there until September 14, 1974, when the last coal was mined in the county. Earlier in 1974 Commonwealth Edison Co. had purchased the 7800 acres owned by the coal company in Grundy, Will, and Kankakee Counties for the construction of Braidwood Nuclear Power Station. A cooling lake of 4900 acres was built, utilizing the old strip mine pits. Strip mining had lasted 47 years and produced just under 50 million tons of coal. 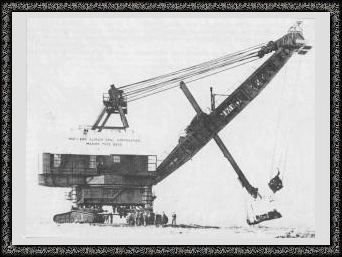 At the close of mining in the area, Peabody Coal Co., which had bought out the Northern some years earlier, sent the German-built wheel excavator, capable of moving 3200 yards per hour, to Belleville. One of the draglines went to Shawneetown, Illinois; the other dragline went to Black Mesa on the Navajo Indian Reservation in Arizona. A smaller dragline went to Colorado, the 100-ton trucks moved to Missouri, and the pumps, shop equipment and supplies were all placed where needed most. A circular prepared in 1985 by the Illinois Department of Energy and Natural Resources defines deep mineable coal as 28 inches or more and having overburden depths of 150 feet or greater. Surface-mineable coal is 18 inches or more in thickness and having overburden not exceeding 150 feet. Grundy County still has 453 million tons of surface mineable coal, of which 51 million tons has high development potential. Deep mineable coal amounts to over 1000 times the surface mineable coal at 486,554 million tons. Grundy, Livingston, and LaSalle Counties have six billion tons of coal reserves. Peabody Coal Co. still owns approximately 1200 acres of land in Wauponsee Township with high development potential for surface mining. Goose Lake and Felix Townships still contain 18 million tons of surface mineable coal. When the thicker seams of Southern Illinois are mined out, attention may again turn to the resources that remain in the area. One of eight crawler tracks of the "wheel"
Stripping shovel and coal loading shovel filling a truck.